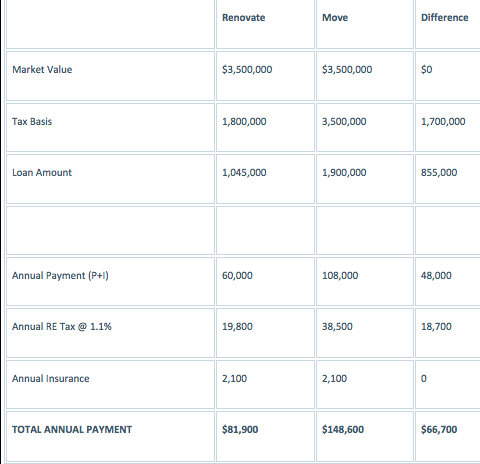 Why California Impact Fees Are So High? The knee-jerk response here would be to blame California’s high tax/regulation environment for runaway fees. While there is some truth to that statement, I don’t believe that is the main culprit here since California’s property taxes are actually very low and therein lies the root cause: Proposition 13. California has no such problem. In 1978, nearly 2/3 of the state voted to reduce the property tax to 1% of the value at the time that the real estate was purchased (that rate doesn’t include local assessments that must be approved a 2/3 majority and any Mello Roos fees associated with an underlying CFD) and capped future increases to no more than 2%. It also took the responsibility for allocating property taxes from local municipalities and transferred it to the state. Prop 13 was intended to avoid the New Jersey scenario mentioned above of people getting taxed out of their homes. In that regard, it has been a success. However, it created a major market distortion and provided fuel that helped property values soar. It also led to a decrease in local revenues and forced local governments to rely increasingly on impact fees to mitigate the impacts created by new development. In other words, local governments could no longer rely on spreading the cost of new infrastructure across an entire tax base, they now had to focus the cost solely on new development which constitutes a much smaller number of units. It also means that a local government only gets one bite at the proverbial apple via impact fees rather than a recurring income stream that can be assessed upwards as need dictates. This “one bite” mentality provides a large incentive for local governments to hike non-recurring fees in order to pad a highly irregular income stream, shifting the full infrastructure burden to new units to the benefit of existing ones. Under Prop 13, new developments bear the brunt of all new infrastructure by default, primarily because there is literally nowhere else left for the income to come from. As the old saying goes, there ain’t no free lunch. Prop 13 didn’t actually force a reduction of government as many claimed it would, instead, it merely shifted the burden of funding the local government from many too few and home builders and land developers are paying the price for that today. That works fine when prices are increasing enough to offset rising impact fees. However, prices in secondary markets like the Inland Empire haven’t recovered anywhere close to their prior peak while fees have continued to rise which is a big reason that the market is so stagnant today. 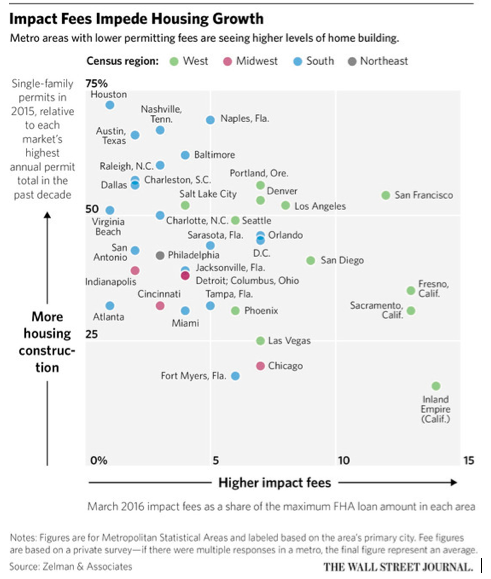 The counter example to Corona (in the Inland Empire) in the Zelman video is Houston, Texas, which has been the leader in housing expansion during this cycle and has nominal impact fees of about $1,000 per home. Texas is commonly considered to be a low tax state (at least when compared to California) but that actually isn’t when it comes to property taxes. Believe it or not, the Lone Star State has the fifth highest property taxes in the US which is a large part of the reason why they are able to keep impact fees so low. Property owners and investors benefit greatly from Prop 13 since it keeps their taxes low and allows them to lock-in a basis that only increases moderately over time. I would argue though that it has largely hurt developers and buyers of new homes who are the only ones left to plug the gap of the revenue shortfalls that hit local governments when Prop 13 was passed. Again, there ain’t no free lunch. Someone ALWAYS pays. Part 2: I now want to take a closer look at an issue in high-priced coastal markets that’s somewhat related to Prop 13: why people in high priced California markets are renovating rather than moving when they are ready for a new house. But over time, Lido evolved — first as a vacation spot for Angelenos and Inlanders looking for a weekend escape, and later, in the 1970s, to a residential community where people settled year-round. It is also a place people do not leave: one-third of Lido Isle’s residents have lived there for more than 20 years. In recent years, compared to the rest of Newport Beach, I think Lido Isle has been undervalued,” said real estate agent Alison McCormick, a third-generation Lido resident. According to The Wall Street Journal, “California may be a capital of cosmetic surgery, but it’s not just noses and eyelids falling under the knife. A hot housing market is driving buyers to pay exorbitant sums for old, frumpy houses, knowing they’ll pay plenty more to remake them to modern tastes. Others currently own dowdy houses and choose to renovate rather than relocate. There is another tax provision in addition to Prop 13 that is fueling this as well and that’s the IRS home sale exemption that allows a seller to pay no tax on a gain up to $500k (assuming a married couple filing jointly) so long as they have lived in the house (rentals don’t count) for at least two years. $500k is a huge amount of money and around double the median national home price. However, in coastal California cities where zoning is highly restrictive, it’s not unusual to see the increase in value exceed that amount by a substantial amount over time, leading to a problem when you run out of space. Let’s take a hypothetical Lido Isle resident from the example in the beginning of the post. Assume that a family bought a house on Lido back in 2003 for the median sale price of $1MM in that year, put 20% down got a 30-year mortgage at 4% (I’m trying to keep things simple so I’m using today’s rate). Now let’s assume that they need more space and have a decision to make: move to a larger house in the same area or sell. Assume that their sales value is today’s median price of $2.5MM and a larger house in a similar neighborhood costs $3.5MM (again, I know the values are obscene but that has been the reality on the coast out here for quite a while). If they sell the house, their tax basis will increase from just under $1.3MM (it’s been inflating at 2% per year despite the property value increasing much more) to $3.5MM, meaning a difference of about $20,000 per year assuming a 1.1% effective tax rate. On top of that you have a capital gain of $1.5MM, $1MM of which is subject to capital gains subject to a 20% Federal tax and 13.3% state tax (assuming the highest brackets). That means you are left with a net gain of $1,167,000 after you pay $333,000 in capital gains taxes. In addition, the loan has amortized down to $545k so he gets an additional $455k back after the sale for a total of $1,622,000. If he puts all of that amount into the new house as a down-payment, he now needs to take out a loan of just under $1.9MM which means that his monthly payment goes from $3,800 to just under $9,000, a difference of $62,400 a year. The end result is that the owner who renovates and stays in a similar location rather than moving to a larger home in the same neighborhood saves a whopping $66,700 a year under this scenario. A quick disclaimer: I am NOT IN ANY WAY advocating a lifting of the $500k exemption cap. I’m sure a seller with a $1.5MM gain will be just fine. My intent is to point out the reality that there are huge incentives in place to stay put in high-priced closed access California coastal markets unless you have such a large disposable income or net worth that it just doesn’t matter. I picked Newport Beach as an example because it’s one of the most egregious examples in terms of median home prices. However, the same thing is happening up and down the state in cities with lower price tags. If this seems like a recipe for massive home price inflation in coastal markets, you are correct. Extremely high barriers to entry through zoning lit the match that started this fire once the available land was used up and development restrictions prevented adding density. Prop 13 then threw fuel on the fire by giving existing owners a massive incentive to stay put. The final dose of rocket fuel came when high priced markets reached a price point where it became commonplace to have gains that exceeded the Federal capital gains exemption. The result is that fewer people move and fewer houses become available. There was a time that coastal cities in California had entry level housing stock. People would buy them and live there until they outgrew them and then buy a larger, often newer home. Today, those starter homes are getting knocked down or renovated by their owners since there are huge incentives in place to make them stay put. When they do sell, they are often bought up by new buyers rebuild or renovate or developers do the same to sell at a much higher price. The end result is that the older, entry level housing stock near the coast is long gone and we are now stuck relying on new housing construction in inland locations which are nearly impossible to build at an affordable level because impact fees have gone through the roof relative to home prices, another result of Prop 13. As I said last week, large sweeping statutes like Prop 13 have consequences that continue to manifest decades after they are passed. In this case, it’s a dearth of entry-level housing. Landmark Capital Advisors, a real estate capital advisory firm disciplined in finance and private equity works with owners, investors, and developers of commercial and residential real estate.